As a Philosophy major and Ethics minor, I used to frequently struggle with whether or not I would have been better off if I pursued a STEM degree. This feeling branched from being constantly confronted by the narrative that the humanities are neither as rigorous nor as impactful as the hard sciences. However, I have since come to realize the value of the humanities beyond my own personal interest. I am now indebted to the Fox Center for giving me the invaluable opportunity to surround myself with scholars who share the importance of the humanities with their colleagues and their communities. This made me change my perspective on humanistic study. Namely, humanities-focused scholars should not be ‘on defense’ and feel the need to justify humanistic inquiry. Instead, we should be ‘on offense,’ priding ourselves on our work and its impact. Learning this lesson has been especially powerful, for it has instilled in me the confidence that I can pursue a career in Philosophy and know that I will be able to use my research to positively affect people beyond academia. This has influenced my decision to apply for a PhD in Philosophy, which I hope to begin in the Fall of 2019. I have since been able to take these lessons and apply them to my own endeavors. For example, in my thesis, Virtuous Artificial Intelligence, I champion a philosophical approach for examining the socio-ethical implications of artificial intelligence (AI). I also challenge the notion that technology research only involves the hard sciences. This is because research that concerns humanity must also recognize its underlying humanistic elements in order to have the most desirable impact on society. I organized my thesis into three distinct chapters: 1) Problematizing Artificial Intelligence, 2) Regarding Moral Sentience, and 3) Considering Ethical Systems. I begin by asserting that we must understand how to conceive AI before we can sketch a blueprint of a future with person and non-person morally-sentient beings. I then argued that due to recent explosive advancements in AI, we will soon reach a point when persons’ and AIs’ moral sentiences are indistinguishable. When this happens, AIs should abide by a system of ethics to ensure the protection of person and non-person morally-sentient beings. Furthermore, I assert that ethical morally-sen(ent AIs would necessarily follow a system of Aristotelean virtue ethics. Following a virtue-ethics system would equip AIs to balance competing obligations through creative wise decision-making, or corrective prohairesis. I conclude by showing how an AI virtue ethicist would be able to learn prima facie virtues, thus removing the supererogatory burden off of programmers to code the ‘perfectly-ethical’ AI. Now that my time at Emory is coming to a close, I can proudly say that being at the Fox Center has been one of the highlights of my undergraduate career. 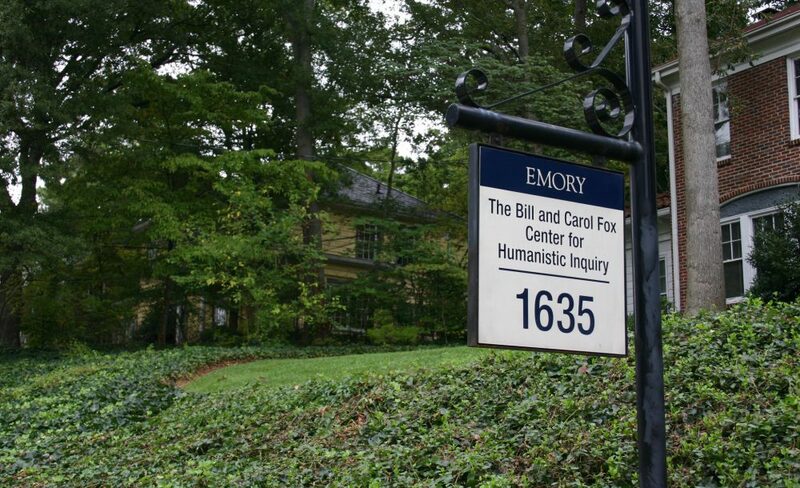 I am humbled to have been welcomed to such an inspiring community of scholars, and I am excited to continue the legacy of Bill and Carol Fox with promise and pride. Benjamin Goldfein is a senior majoring in Philosophy and minoring in Ethics. His senior honors thesis champions a philosophical approach for examining the socio-ethical implications of artificial intelligence. Namely, Ben focuses on how recent technological advancements force us to reconsider what it means to ‘be human’ in regards to our personal identities and relationships with other morally-sentient beings. When I first learned there was a painting by Frederic Leighton hanging in the library at Agnes Scott College here in Decatur, Georgia, I was stunned. While Frederic Leighton is certainly not a household name, he is one of the most influential British painters in all of history—he was elected President of the Royal Academy (the leading art institution in London) in 1878; in that same year, he was knighted, and eight years later he became a Baron. Thrilled by the opportunity to study a painting by such an important figure less than fifteen minutes from Emory’s campus, I determined to make The Reconciliation of the Montagues and the Capulets Over the Dead Bodies of Romeo and Juliet (1855) by Frederic Leighton the subject of my honors thesis. My excitement over Atlanta’s Lord Leighton was short-lived, however, as a week later I discovered that the painting at Agnes Scott was a copy of The Reconciliation—not the original work. The original painting had hung at Agnes Scott, though, for nearly forty years from 1963 to 1999, and many art historians still mistake this reproduction for the original. While I was disappointed that I would not be able to study from the original work of art, I still wondered why The Reconciliation had spent so long at an American university thousands of miles away from Leighton’s home—and how it ended up there in the first part. Prompted by these questions, I decided to trace the painting’s unusual history from the moment it left Leighton’s studio in 1855 until now. As I began my preliminary research last spring, I quickly realized that the same things that attracted me to The Reconciliation also made it a difficult painting to study. Since it was located on a different continent than most Leighton scholars, there was little research on The Reconciliation, so I had to work almost entirely off of primary sources—many of which were in London. I was fortunate to receive a Bradley Currey, Jr. seminar grant, which provided funding to study archival material in London over the summer. Before departing, I searched online catalogues for unpublished letters Leighton had written around 1855 and for any exhibition reviews that mentioned the work. In June, I flew to London with a list of archives and eagerly embarked on a week of intensive research. While in London, I was validated to discover that almost everyone I spoke to knew of Frederic Leighton. Granted, I spent most of my time at art institutions like the Royal Academy and the Victoria and Albert Museum, so my sample was probably a little biased. Still, it was nice to learn that so many people were familiar with Leighton’s work, especially as I received a much different reaction when I discussed my research with people in the United States (mostly blank stares and puzzled nods). One of the highlights of my trip was viewing one of Leighton’s original sketches for The Reconciliation. I could make out all of his stray pencil scratches and erasure marks, which made a man who had been dead for over one hundred years seem to come alive in the room with me. Visiting Leighton’s former studio house, which had been converted to a museum in 1929, had a similar effect. As I read countless letters and sifted through pages of exhibition texts, I began to piece together a general outline of where The Reconciliation had traveled. When I returned to the United States, I continued to fill in this outline as I uncovered new details about the painting’s history. After nearly a year of study, I finally have a near complete picture of The Reconciliation’s timeline—though there are still some areas to be developed in future research. As a very condensed summary, Leighton struggled to sell The Reconciliation in Europe, so he sent it to The American Exhibition of British Art, an exhibition that brought paintings by British artists to New York, Philadelphia, and Boston. In Philadelphia, Joseph Harrison, an engineer-turned-art collector, purchased the work for 400 pounds—the highest price of any of the sales made during the Exhibition, which is impressive considering that Leighton was still a relatively unknown twenty-eight-year-old artist at the time. Harrison probably bought the painting to decorate his enormous mansion in Rittenhouse Square, Philadelphia. After he died, Harrison left the painting to his wife, Sarah. By the time of Harrison’s death, Leighton was beginning to become quite famous, so Sarah kept The Reconciliation until her own death in 1906. Six years later, The Reconciliation was sold at an estate auction. For the next fifty years, Victorian paintings were viewed as very unfashionable—no one wanted to be caught owning one. During this time, The Reconciliation faded into obscurity until it was donated to Agnes Scott College by an alumna of in 1963. Then, as Victorian paintings became more popular, The Reconciliation reentered the public spotlight. In 1999, Agnes Scott decided to sell the painting to raise money for the Department of Art and Art History, and in 2003 it was purchased by an anonymous British private collector in London. Like Harrison, this private collector wanted to hang The Reconciliation in his home. Jenifer Norwalk is a senior majoring in Art History. Her senior honors thesis investigates The Reconciliation of the Montagues and Capulets Over the Dead Bodies of Romeo and Juliet, a painting by nineteenth-century British artist Frederic Leighton. The Reconciliation hung in the library at Agnes Scott College for nearly fifty years until it was sold to a private collector in 2003, and as a result of its unlikely location here in Atlanta has been largely excluded from Leighton scholarship. Within the paper, Jenifer focuses on how The Reconciliation reveals Leighton’s views about the art of the 1850s—an important artistic period that saw the union of the academic and avant-garde across Europe.